Todd Fuhrmann talks to the football team about safety during practice on Wednesday, Aug. 15. Coach Steve Kilby gathers his team up for a talk during soccer practice. 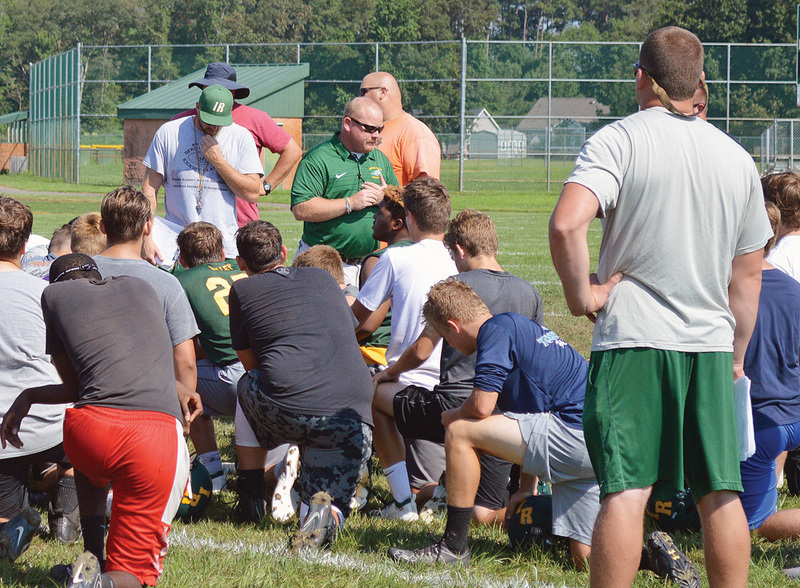 As with the start of any new season, optimism and excitement were in the air all around the campus at Indian River High School on Wednesday morning as the fall sports programs all officially began their 2018 campaigns. The football, boys’ soccer, field hockey, girls’ volleyball and cross-country teams all laced up their collective shoes and headed out onto their respective fields or hardwoods to embark on what all the coaches deemed as the potential for successful and exciting seasons. 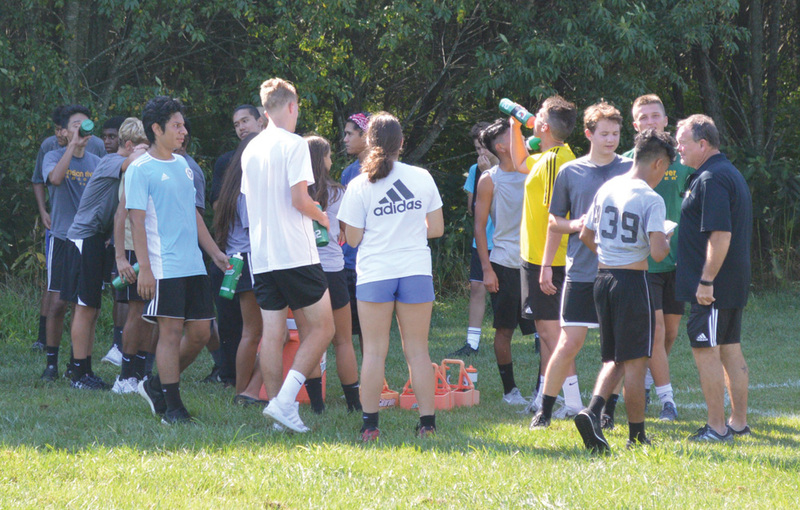 Head coach Steve Kilby is back for another season guiding the boys’ soccer program and saw close to 50 players out on the first day. He said he was thrilled with the turnout, but admitted his team has some work to do to get where they want to go. But more importantly than that, for Kilby, was the excitement of just being out on the field to start the season. Across the way, on the football practice field, head coach Phil Townsend and his staff welcomed their gridiron warriors with their sights clearly set on improving upon last year’s disappointing results. According to Townsend, the squad should have roughly 50 players once the paperwork from everyone’s physicals is all completed. Jodi Stone and her girls’ field hockey players were at Clayton Elementary School for their first practice, as their normal field continues to literally grow after work done over the summer to install new Bermuda grass onto the surface. Unfortunately for Stone, the turnout was a little lower than she had hoped for when sign-ups originally took place, but she maintained that the 24 girls out this year have the potential to be very good simply with their dedication and willingness to work. “And I will take that over numbers any day of the week,” she confessed. Inside, away from the heat and humidity, Jim Barnes and his staff had their girls’ volleyball players working hard and still working up a sweat, having started their day at 6:30 a.m. Following a 14-1 regular season, Barnes said he feels that this season has the chance to be even better than last year. The cross-country team and head coach Steve O’Boyle also started their season with — well, what else would a cross-country team do? — a long run around the area to start their preparations for the 2018 season. The girls’ cross-country squad is looking to continue their success from a year ago, when they went 7-4, while the boys’ unit is hoping to reverse their struggles from a 2-9 campaign in 2017.